Kraft Foods Foundation understands that a healthy lifestyle isn’t just about eating well. It also requires exercise—and for kids, that means lots of regular outdoor play. 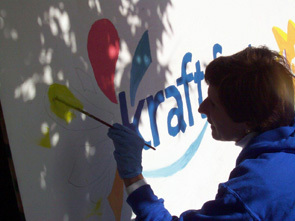 As our newest official National Partner, Kraft Foods is serving alongside KaBOOM! as a proponent of the importance of play and will assist in creating solutions to address the play deficit currently existing in thousands of communities nationwide. 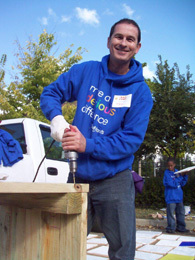 The new national partnership is launching this week, with over 1,300 Kraft Foods employees volunteering to build 13 playgrounds across the country. These playgrounds, part of Kraft Foods’ Make A Delicious Difference Week, will eventually serve more than 100,000 children. 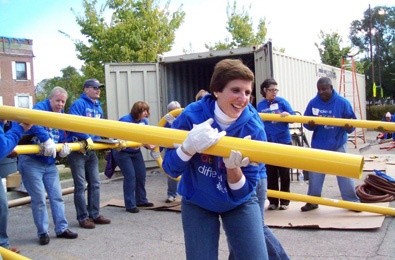 Kraft employees, including CEO Irene Rosenfeld (bottom left), are hard at work putting up playgrounds this week as part of their international effort to Make A Delicious Difference. 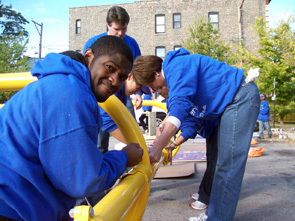 Recognizing that play is critical to the development of children, Kraft Foods is not only helping to build new playgrounds, but is also investing in the ongoing development of tools and resources that communities can use to ensure that children across the country have access to a great place to play within walking distance of their homes.